Egypt bombed ISIS targets in Libya today, in retaliation to the grusesome beheading of 21 Coptic Christian Egyptian workers a day earlier. The militant group shared a video on YouTube showing the beheading of the Egyptian workers, which were abducted over a month ago, creating an out roar in Egypt. Twitter has been flooded with expressions of sadness, sympathy, and anger after the news of the beheading of the 21 hostages spread. A flood of criticism also pointed out the failures of the current Egyptian administration. 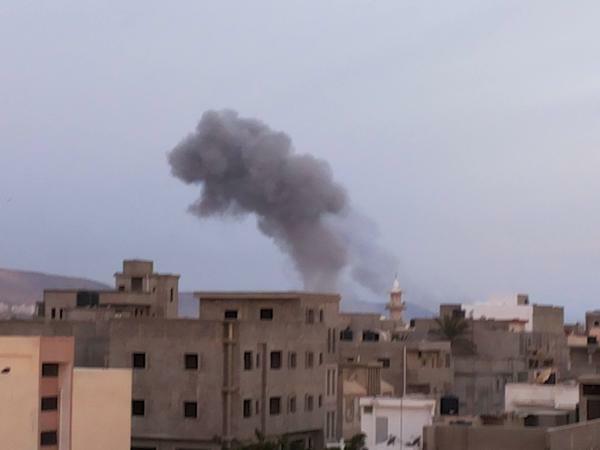 According to news reports, about eight attacks targeted camps, training sites and weapon storage facilities in Derna, which has been taken over by an ISIS affiliate last year. The video shows destroyed buildings, in a residential area, with smoke billowing out of a building. #Egypt coordinated with #Libya to hit #IS in #Libya: 5 houses belonging to #IS commanders and the "IS Islamic Tribunal" hit by airforce. On its Facebook page, the Egyptian Armed Forces shares this footage of its fighter jets taking off for the airstrikes on Libya. For many on Twitter, the ISIS plan of pulling regional players into the conflict has paid off by beheading the 21 Coptic Egyptians in Libya. ISIS is regularly getting out of regional powers exactly the (predictable) reaction it wanted and planned for. Retaliatory strikes aren't a side effect for IS, they're part of their plan. Also collateral damage by the strikes (read: dead baby vids). Strike who & where & what are the consequences 4 us?Cross the border Egyptian intervention will bring destruction & more recruitment 4 ISIS! #ISIS will have hoped to provoke #Egypt airstrikes in #Libya – this fits perfectly its vision of escalating conflict & chaos in the region. For Libyans, the strikes will further complicate a grave situation. Libyans have been presented w/ a very strong motivation to galvanize behind both an ISIS threat & foreign military intervention – will they? Wake up Libyans! Your country is about to become another battle ground as in Syria and Iraq, while our politicians do nothing but bicker!! In Arabic, the hashtag #ضد_التدخل_العسكري_المصري_في_ليبيا which translates to Against the Military Intervention of Egypt in Libya has been active.